The analysis in this report is based on telephone interviews among a national sample of 5,000 adults. These respondents were originally among the 35,071 who were interviewed in the national telephone survey that served as the centerpiece of the Pew Research Center’s 2014 Religious Landscape Study; they were subsequently recontacted and asked additional questions. This “recontact” survey was conducted under the direction of Abt SRBI March 17-May 6, 2015. Interviews were conducted in English and Spanish; 2,013 respondents were interviewed on a landline telephone and 2,987 were interviewed on a cell phone. 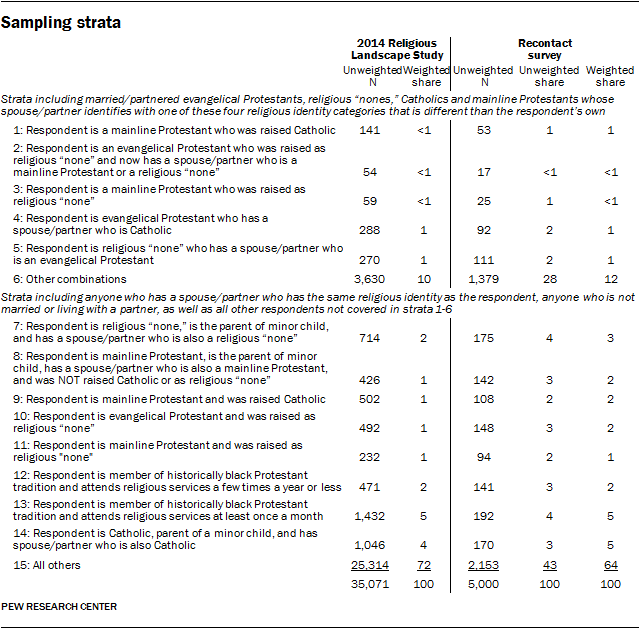 Respondents who participated in the 2014 Religious Landscape Study’s original telephone survey were sorted into 15 recontact strata based on a variety of religious and demographic characteristics. 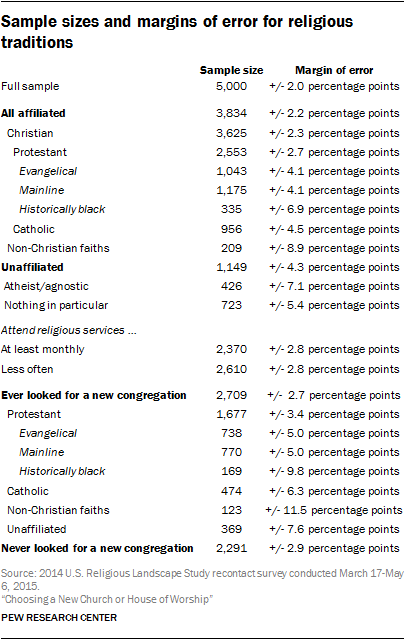 In order to support the analytical goals of the project, certain groups (e.g., religiously intermarried respondents) were oversampled, while others were undersampled (see accompanying tables). After data collection, the data were weighted (as described below) such that all 15 strata are represented in roughly their proper proportion in the study’s final, weighted estimates. The demographic benchmarks for age, gender, education level, race, and state came from an analysis of the Census Bureau’s 2013 American Community Survey (ACS) one-year estimates, which was the most current data source available at the time the 2014 Religious Landscape Study data were weighted. The ACS parameters were calculated for adults ages 18 and older residing in households in the U.S., excluding those living in institutionalized group quarters. The population density parameter was derived from Census 2010 data and filtered on adults ages 18 and older residing in the U.S. The benchmark for religious affiliation was based on weighted estimates of self-reported data from the 2014 Religious Landscape Study. The telephone service parameter was constructed from model-based estimates released by the National Center for Health Statistics for July-December 2013, projected to the year 2014. These estimates were based on adults, ages 18 and older, living in households with a telephone (either landline or cell). The completion rate for this study was 37.2%. Taken together with the response rate to the original 2014 Religious Landscape Study, the cumulative response rate of the new survey is 3.9%. Weighting and survey design features that depart from simple random sampling tend to result in a loss of precision in survey estimates. This loss of precision, known as the design effect, is incorporated in all margins of error, standard errors and tests of statistical significance included in this report. Generally speaking, larger sample sizes are associated with smaller margins of sampling error, and smaller sample sizes are associated with larger margins of error. The margin of error for national estimates from this survey is +/- 2.0 percentage points. The margins of error for subgroups are larger. The accompanying table presents sample sizes and corresponding margins of error for the religious traditions discussed throughout much of this report. Sample sizes and margins of error for other groups are available upon request.